I did a double-take because it just seemed so wrong. 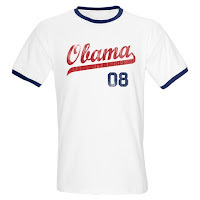 Hipster shirts with "vintage" or retro looks are quite popular right now, and I often find them funny or nostalgic. But it never occurred to me that the trend would crop up in presidential politics, and the resulting combination was jarring. You can see many of the myriad options here. 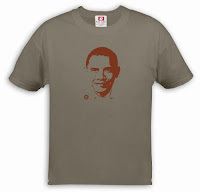 I figured that this just reflected the cult of personality that has evolved around Obama, because the site I linked to, CafePress.com, is one where individuals submit their designs for products, and CafePress prints them on demand. In other words, it's nothing official. 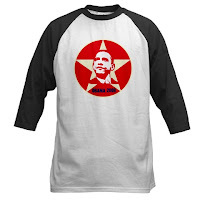 Yes, his official campaign website is selling a t-shirt that is eerily similar to the iconic posterized image of Che Guevara that is de rigueur with the hipster/leftist set. Is it an unimportant coincidence? A cynical, calculated attempt to hype his cult of personality with the 18-34 demographic? It's probably both. I recognize that none of this could be considered deep, hard-hitting analysis, but I do think it's an interesting cultural phenomenon, and helps to highlight the creepy, cultish adoration of Obama's followers. 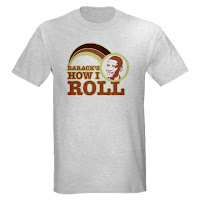 The weird, superficial nature of these hipster t-shirts is a perfect complement to the vacuous campaign and person of Barack Obama. In the New York Magazine article, "Money Chooses Sides," note the composition of the photograph that accompanies it. I do not think it is accidental. I do not know if the photographer (or even Obama himself) intended the tableau, but of all the pictures doubtless taken of the event, this was the one selected by the magazine's editors to illustrate Obama's influence. Their motive may have been mockery of the guests or unintended adulation of Obama. That is irrelevant. The picture captures the essence of Obama's appeal. Obama seems to descend the stairs, microphone in hand, looking very preacherly as he brings the "gospel" to the mortals below. All the mortals gape up at him with undisguised worship, as though he were indeed a messiah or savior, and are hanging on his every word. Remember that these are all Park and Fifth Avenue millionaires there by RSVP. A good political cartoonist could render the photograph to show Obama in Moses-like robes, one hand raised with an instructive finger pointed in the air, the other arm cradling two stone tablets with the Ten Commandments of socialism (the words, however, would be fuzzy and nearly illegible). The only person not gaping at Obama is George Soros, seated directly behind Obama's left. He looks vaguely bored but also smugly content with what he is hearing and with the undivided attention of the other guests. The photo is quite striking, and Cline's description is spot on. Below is Raphael's version of this scene, circa 1516, and my Photoshopped version (a poor attempt at rising to Cline's challenge to political cartoonists). I like what I did with the photo, but I think the original photo is more impressive because it's real. I think that, assuming Obama wins, if America ever wakes up and looks back at his failed presidency and the mix of mass hysteria and corrupt philosophy that swept this demagogue into office, this photograph could be one of the iconic images of the times that helps to explain what went wrong. Don't discount the importance of your analysis. It does say something that young people are willing to put an image (particularly one reminiscent of Che Guevera) of a presidential candidate on their shirts. Something very scary. We need a t-shirt counter-attack! I love clever t-shirts. While the graphics are basic, I enjoy my Stop Plate Tectonics shirt. I get a lot of smiles when I wear it (I think most people are just confused by it). And I'm just waiting on someone smart (or an ex-nun) to tell me how to diagram the sentence, "There is something I am aware of" which I think would make an awesome t-shirt! Finally, there's the one I made tonight upon request. While none of them have that retro hipster look, they might spark an interesting conversation or two. I really like your STOP PLATE TECTONICS shirt, but I would never wear it. I have a hard time wearing t-shirts that have sayings like this. I think it's because when I go out in public, I want any interactions I have to be completely on my own terms. I don't want to wear something that invites conversation. I'm quite the prude when it comes to things like this. I think that, when they're old enough, my kids are going to call me the "Fun Police". I can certainly appreciate that. I mostly wear it when I'm running, rollerblading, or biking away from people. It's big enough to read, but the reader and I are generally going in opposite directions. http://www.thinkgeek.com/tshirts/generic/a69c/. "You read my t-shirt, that's enough social interaction for one day."